INSULTS: Constant criticism, which emotionally injures your personal, emotional, sexual, professional, or other selves. Insults can greatly undermine your self-confidence and eventually cripple you emotionally. REJECTION: Direct or indirect statements, which create feelings of unworthiness. Insults and rejections teach the victim that she/he is not worthy of receiving loving behavior. Rejections can be used as punishment for not cooperating with an abusive pattern. Also abusers may deliver a rejection in an attempt to justify their anger towards you. EMOTIONAL THREATS AND ACCUSATIONS: Direct or indirect statements about the intent to cause emotional or physical harm, or to create emotional loss to yourself or those you love, depend on, or are responsible for. This includes lying about your behavior, attitudes, or emotional state to anyone else in such a way that you cannot defend yourself. EMOTIONAL BLACKMAIL: A statement or behavior, which uses your fear, guilt, insecurity, or confusion to trap you into giving the abuser power over you. Most victims prefer their private lives to remain private. 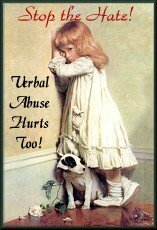 To an already terrorized person, emotional blackmail may result in a blank check to the abuser in her/his life. CRAZY-MAKING STATEMENTS AND BEHAVIOR: Distorts reality and destroys the possibility of honest communication creating confusion and insecurity. Examples include: -- saying one thing and meaning/doing another, acting ignorant about a known subject, stating a lie as if it were a known truth, having good intentions or regrets which are never acted upon. NOT BEING TAKEN SERIOUSLY, BEING IGNORED AND NEGLECTED: And other ways of undermining self-esteem. Ignored requests and denied needs cause self-doubt and emotional pain. It leaves one feeling unimportant and possibly undeserving of fair treatment. SOCIAL AND SEXUAL PREJUDICE: Added to all the other forms of emotional abuse which females suffer, society often perceives women as helpless, emotionally immature and often irrational. Once an abusive relationship is ended, they still struggle with being treated fairly. Fortunately, the assertive skills learned, as a recovering victim can be put to good use in a sexist society. POSSESSIVE AND PUNITIVE BEHAVIOR: Perceiving a person as property. The behavior can include: jealousy, limiting freedom, creating isolation, denying capabilities, blocking opportunities to develop skills, talents, and potential. BASING A RELATIONSHIP ON UNREALISTIC EXPECTATIONS: The abuser assumes he/she knows what is best for the victim. Being denied the opportunity to discover and define oneself prevents the possibility of developing a mutually beneficial and realistic relationship. By imposing self-interests upon another person, the abuser creates an emotionally unhealthy obligation for both people. THE RIGHT TO say "I don't know" or "I don't care"